Songs of Eretz Poetry Review is pleased to present "Gingko Tree" by Carol Hamilton, Poet of the Month. Ms. Hamilton will also be serving as the guest judge for the Songs of Eretz Poetry Award Contest, which will run from September 1 to October 15, 2015. A detailed biography of Ms. Hamilton may be found here: http://eretzsongs.blogspot.com/2015/08/songs-of-eretz-poetry-review-poet-of.html. The contest guidelines may be previewed here: http://eretzsongs.blogspot.com/p/songs-of-eretz.html. in the sap from pre-historic times. mingled, trailed, clumped around that man. going in this harsh-weathered place. From China. To Japan. To here. in golden lights of evening. Poet’s Notes: This piece takes great delight in naming things and in the sound of the words, but also in memory. 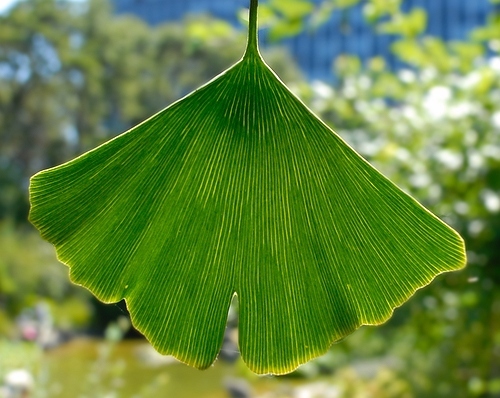 The idea of the gingko tree is fascinating to me, thinking of how ancient it is. I planted a gingko tree in my front yard perhaps seven or eight years ago. It is healthy but not much taller than it was when I first planted it. I suspect in some future day it will be a huge and primeval presence in my front yard. Of course, some future owner may not feel as sentimental as I do about the historic vein structures of leaves and such. When I taught in an elementary school program for gifted children, we had sixteen schools, each attending our program one day a week. Every year for four days in a row, we took all of our students to the campus of the University of Oklahoma. The landscape chief there, an enthusiastic man named Randy Lacewell, walked us around the campus telling us the story of his wonderful landscaping. His recounting of the simple vein structure of this most ancient of trees made a big impression on me. Editor’s Note: This poem brought back the memory of when I first saw a gingko. I was about ten years old, and was fascinated that the species existed since the Age of the Dinosaurs, as, like most boys, dinosaurs also fascinated me. The tree had been planted with some pride and hoopla in Albany, New York, then a much smaller city than it is today. Imagine my delight when I discovered a truly colossal gingko on the campus of the Kansas City Art Institute. That experience too brought back the memory of the gingko in Albany, and reminded me that, like the gingko, I am a transplant from a foreign land. “Gingko Tree” was originally published in Westview.